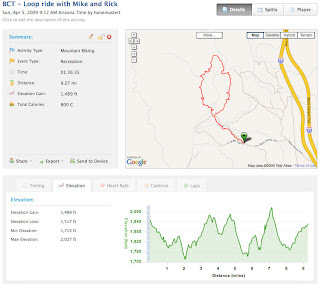 Mike emailed me the other night, said that his neighbor Rick and he were planning on riding the BCT loop, which is not far from his place up in New River. I wanted to see how the new bike would do on something more cross-country in nature, so I dialed down the shock and tossed it into the Honda Element and met them Sunday morning. About 10mins into the ride, I was following Rick down a kinda fast section of trail when my front tire washed out. Murphy's Law was in full effect! I landed on the *only* bed of Cholla Cactus balls in that section of trail. That sucker was hidden from view, like a speed trap near the Mogollon Rim, just waiting for a lamer like me to happen by. 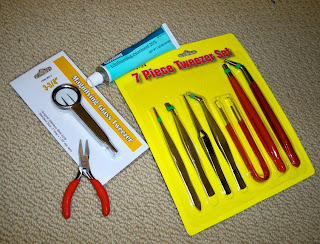 Thanks to Mikes flat nosed pliers, I was able to remove the bulk of the spines. 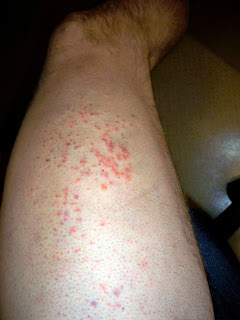 The other thing that I was thankful for, was the scrape down lower on my leg? huh? I'd kept re-injuring the same spot, so I wore the kyle strait knee pads and shin wraps for this ride, despite it being total overkill. My knee and lower leg was saved the nasty fate that my upper leg (thigh) suffered. ouch! that is some texture! do you blame the new bike, or the rider? 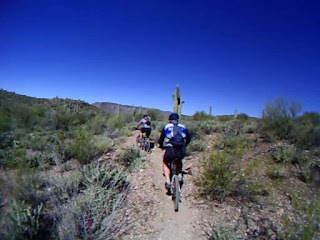 I hit BCT on the Heckler after Sedona 2 weeks ago and it was fun on a big bike to just relax and enjoy. Both! I have been running the tires in the low 30's (psi) jacked it up to 38psi for the more XC nature of the ride. Also, dialing the shock all the way down really changes the geo of the 5 Spot. Makes it much less slack/forgiving. The spines in the fingers/hand bug me worse than the leg, less nerve endings there!